Water colour painting of the Dock showing a cargo vessel being loaded. This marine painting is a popular theme with Claude Buckle. He has drawn many examples of cargo ships in the ports with various scenes depicted the loading and unloading of goods. 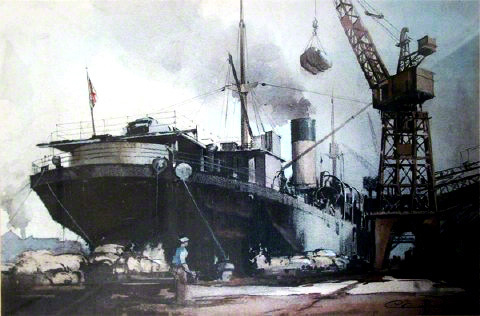 The water colour painting of the Dock shows a cargo vessel being loaded by the crane on the right of the picture. On the quayside there are stacked goods waiting to be lifted and various figures helping in the operation. Created in 1949.